I’ve written about Delfey (also spelled Delphia) before. She’s one of my maternal great-great-great-grandmothers and was born about 1808. By all accounts, she is the daughter of William Hendry (b. 1760) and Rose (b. 1790), a woman he owned. Because Delphia was his daughter–and because he seems to have promised Rose that he would eventually free Delphia–he made arrangements in this document and in others to carry out that commitment. William Hendry values “the Mulatto girl named Delfey,” who is his daughter, at $300. Seeing the $300 valuation made me curious. What would the equivalent amount be today? It turns out that a valuation can be interpreted in many ways. MeasuringWorth.com, a website that strives to provide accurate historical data on economic aggregates, distinguishes three categories: 1) the cost or value of a commodity 2) income or wealth and 3) a project (an investment or the construction something like a canal or cable network). Just to put things in perspective: In 1808, the year Delphia was born, a man named Stephen Kirk puchased 202 1/2 acres in Baldwin County, Georgia for $450.00. I’m still looking for some Greene County, Tennessee sales so I can make a more direct comparison. So many questions. What a conundrum to own one of your children and to place a value on her as you would a plow or a horse and yet to have bucked custom and provided a legal path for her freedom. What convoluted calculations determined that this child was worth $300 while the bequest to your sons was $50? Who was Nancy McEfee and why was Delphia conveyed to her and then returned? As I have learned through the years from other Hendry descendants and relatives who have generously shared documents and information, there is much more to Delphia Hendry’s story. A few months ago, Robert Purvis, reached out to me through Ancestry.com. He and I share William Hendry as a great-great-great-great-grandfather. Robert, who is a descendant of one of Hendry’s sons, directed me to a page on the Race and Slavery Petitions Project website that included a petition filed on October 19, 1833 (five years before William Hendry’s will) for Delphia’s freedom. 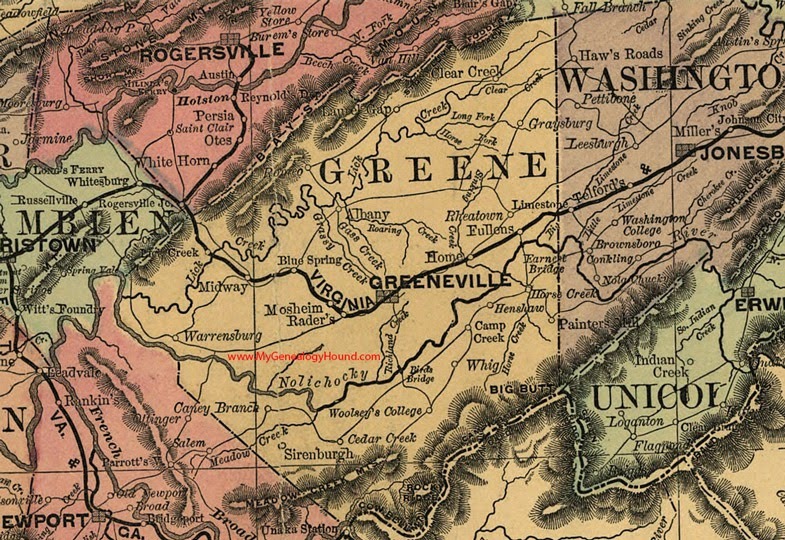 Greene County, Tennessee in 1888. I knew from the emancipation certificate, which my grandfather had lovingly saved and given to me almost forty years ago, that Delphia eventually was freed in 1841, twenty-three years before the Emancipation Proclamation of January 1, 1863. But as the 1833 petition shows, there was incredible resistance to her emancipation. The journey to freedom seems to have been formally set in motion in 1827 when Delphia was 19 years old. It was then, as the 1833 petition says, that William Hendry, gave Delphia (“a certain colored gal by the name of Delfe”) to his son-in-law, John McEfee, husband of Nancy Hendry McEfee, one of his white daughters. McEfee, in turn sold Delphia to her mother, Rose, for $300. McEfee, according to the 1833 petition, then gave Rose “a firm bill of sale” that was to allow Rose to set her daughter free. But because Tennessee had a law “prohibiting the emancipation of slaves,” Rose was prevented from freeing her child. Five more years were to pass after Rose’s purchase of Delphia without Delphia actually being freed. In the 1833 document, 25 residents of Greene County Tennessee signed a petition requesting that the county authorize a law to emancipate Delphia. Even though that law was passed, it would take another nine years before Delphia would be emancipated. More answers simply bring more questions. How in the world did Rose get $300 in 1827? Or was the $300 a credit Rose somehow had accumulated toward some debt Hendry owed her? Did Hendry give his mulatto daughter to his white daughter and son-in-law to settle a debt? Who were the 25–presumably white and free–citizens who vouched for Rose and Delphia? This photo is of her son, Henderson B. Robinson, my maternal great-great-grandfather, who was born in 1835 in the midst of these legal battles. Delphia’s son, Henderson B. Robinson, was elected sheriff of Phillips County, Arkansas during Reconstruction. When he and other black elected officials were pushed from office in 1878, he moved his family to Oberlin, Ohio. He later would move to Ohio (Ripley and Oberlin), to Memphis (where my grandfather said he “worked with Robert Church”–Mary Church Terrell’s father–though I have no details of that) and then to Arkansas where he would become superintendent of prisons in Helena, Phillips County, and a member of the Arkansas state legislature during Reconstruction. In the 1880s he moved his family to Ohio and enrolled his children at Oberlin. I continue to ponder and to search and to fill in the blanks, not so much about Delphia and Rose and their relationship with William Hendry–which I will never really know–but about how Delphia prepared her son, Henderson, for the world that lay ahead and how Henderson and his wife, Adelaide, taught their children to navigate America during the late 19th century. This post originally appeared on A'Lelia Bundle's blog as "Delphia: The Price of Freedom." A'Lelia Bundles is an award-winning, bestselling author, journalist, and public speaker. You may follow her on Twitter, Facebook, and can find more of her work at aleliabundles.com.